When I tell people I am a paleontologist and that I go out on “digs,” they usually think I spend most of the trip literally digging in one place for fossils. This happens occasionally but is not typical of my fieldwork. Most of my time in the field is spent looking for fossils; relatively little is actually spent collecting them. In fact, when we are exploring new sites, we may go for days without finding even a scrap of bone. 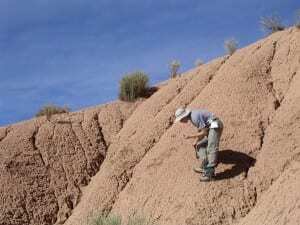 Prospecting: The majority of my time in the field is spent walking around looking for fossils, a type of collecting generally known as prospecting. Many of the fossils I find can simply be picked up off the ground. Most of the others can be excavated by one or two people in a matter of minutes or hours, depending on the size and fragility of the specimen and the hardness of the encasing rock. 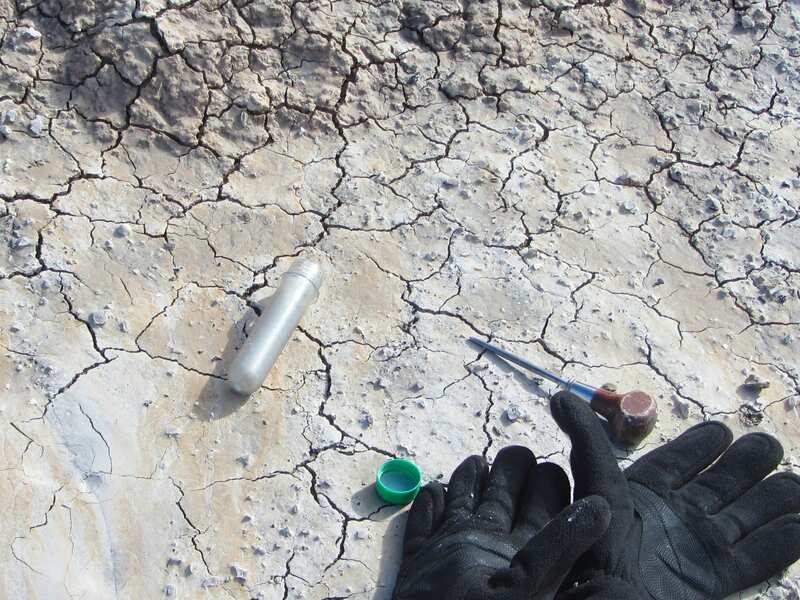 Prospecting is an especially common method of looking for fossils in new areas when you are not exactly sure where fossils will be found. It is a lot like going on a nature hike, except that you are looking for fossils in addition to enjoying the scenery. Quarrying: When paleontologists excavate fossils in one area for an extended period of time, it is known as quarrying. I do not do much quarrying at our fossil mammal sites, mainly due to the types of rocks in which we are working and the manner in which the fossils were preserved. Quarrying is more commonly used to collect large animals such as dinosaurs since the remains of one individual can be spread over a large area. It is also used to excavate highly concentrated deposits that include many individuals. Good examples of this would be the La Brea Tar Pits in California or Agate Fossil Beds in Nebraska. The tar pits accumulated the remains of trapped animals over hundreds to thousands of years. Agate Fossil Beds is a mass death site where many individuals died in a small area during a drought lasting one or a few years. 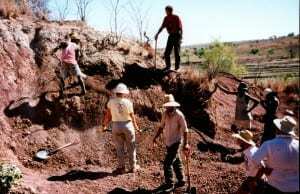 Crawling: A third category of fossil hunting might be called crawling: when a site is so rich with fossils that you have to get on your hands and knees to examine every square inch of ground for bones and teeth. This does not occur very often, usually only when a natural depression allows sediments to be removed by rain and wind but prevents the fossils themselves from being washed away. Given the right conditions, crawling can be one of the best ways to collect small specimens. Crawling differs from quarrying in that specimens are mostly picked off the surface rather than excavated from below the surface. Screen-washing: Sometimes areas can be screen-washed after being crawled. Screen-washing can be thought of as a variation of quarrying. The main difference is that the goal is to collect specimens that are too small to collect easily with the naked eye. The process involves collecting a large amount of sediment with a shovel (usually hundreds or thousands of pounds), placing the sediment in fine screens or mesh bags, and then washing away the the dirt and other fine particles using water. 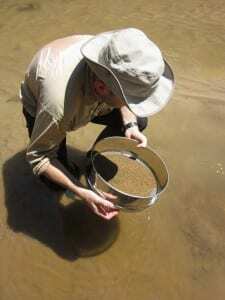 The sediment is usually washed and dried multiple times to remove as much mud and sand as possible. The remaining material, known as “concentrate,” is then examined piece by piece under a dissecting microscope. This allows the small teeth and fossil bones to be separated from the sand, small rocks, and other debris. A typical field season of mine will involve lots of prospecting and collecting isolated specimens, some crawling, and little (if any) quarrying. Only a few of our sites are suitable for screen-washing. 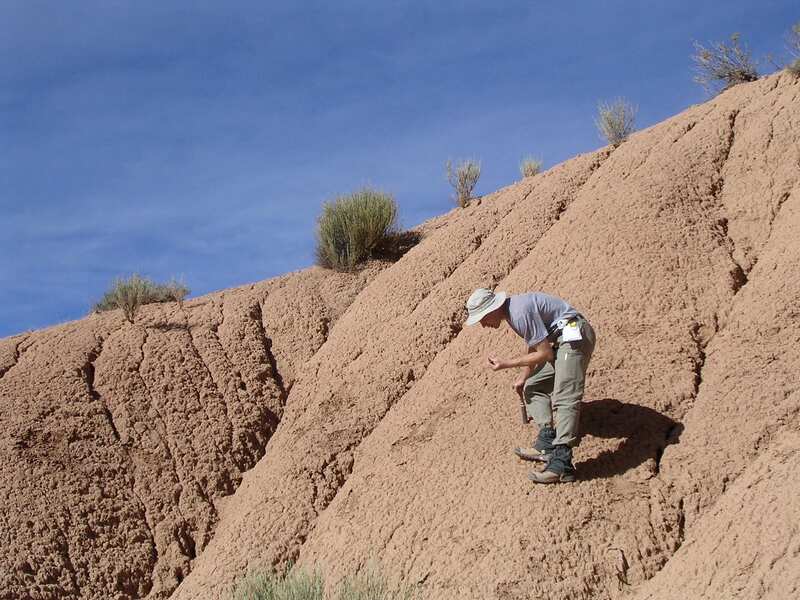 However, depending on where a paleontologist is looking for fossils, what types of rocks they are investigating, and what types of fossils they are looking for, the amount of time they spend in each of these activities can vary significantly.